Yes, I'm a teacher. No, I don't want children of my own. First off, hats off to you teacher moms, I have NO idea how you do it! I can remember being a little girl and wanting kids when I grew up. I didn't grow up with siblings, so I never had the first hand experience of living with a baby. My first real experience with a baby was when my best friend had my god daughter. And while I love the idea of a child that is part me and part my husband, I've never truly wanted to have children of my own. 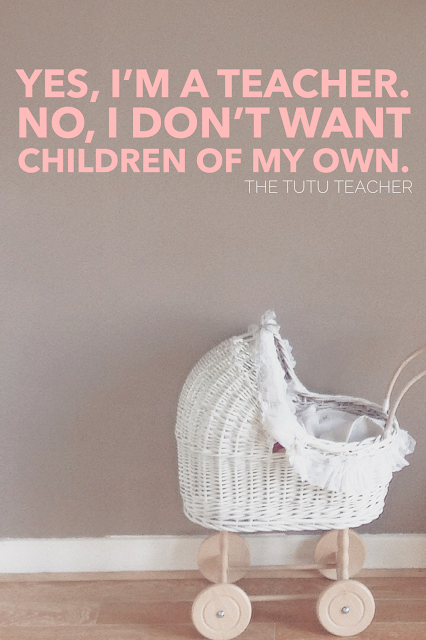 I have talked to many teachers who don't want children of their own. Teachers who consider the children in their class, their own kids. If I'm being honest, I don't want the life I have to change. I don't want to lose the ability to fly to wherever I want in a moments notice, just because. I don't want to lose the ability to take the train to New York with my husband for a quick weekend getaway. And while I know there is so much to gain by being a parent, I just don't think that's the life for me. I think the world is changing and we are slowly learning to accept "different" families. That the word "family" doesn't always mean "with a child". But I still find that many people are quick to change my mind about not wanting children. As if after one 5 minute conversation with a stranger, my thoughts will change and I'll see the light. I don't want children of my own. I am lucky to get 23 (or 25) children of my own every year. People have judged me so harshly over the years for this same belief. And, people are so brave at the questions they ask or the statements they make. Shame on society for judging others. I’m so sorry about your Papa. I admire you honesty in this post and all your posts! Keep doin ya thang, girl! I love reading about your spontaneous purchases and adventures! I am so glad for this post from you this evening. For a long time, I never even thought about kids of my own. It just didn't occur to me. I was getting through college, getting through my first few teaching jobs and now that I've settled into my career as a teacher and had a moment or two to breath, it's occurred to me... I would be perfectly happy without kids of my own. I couldn't agree more with all that you said. And it's very comforting to know that there is another teacher out there that feels the same about her own family. It makes me all the more sure about my decision. It’s ok to have none, one, or 10. ❤️ We shouldn’t have to defend or explain our decisions to have children. I totally get this! I started teaching when my youngest was 5, and I know I couldn't teach and come home to babies/toddlers...and have a classroom of my own. When I see younger teachers with young children, I'm in awe - how do they do this? You're putting yourself and your dreams first - bravo! I love that you are giving voice to so many with your same belief. I'm a fourth grade teacher and I'm married with three kids (1 grown, 1 in his first year of college, and a high-schooler). This is my second career - third if you count my eight years as a stay-at-home-mom. I LOVE being a mom and I LOVE being a teacher...doing both can be really hard - as I've learned over the years. I think the key is CHOICE. I agree with a previous reader, you should not have to defend your choice, it is yours. While you don't have to explain, thank you for your insight. I also wanted children when I was essentially a child. I remember thinking that I didn't understand why a woman wouldn't want children...doesn't every woman? But here you are, like so many others who have shared their perspective. Again, thank you for your candor and insight, even though it is not warranted. I admire you and the lifestyle that you want to maintain. Until women talk about it, we will never know the many facets of a woman. On a slightly different note...you say "after you lost your papa" you knew also knew you did not want children of your own. How did that affect your decision. Love this! I am also a teacher, and NO I do not want children of my own.